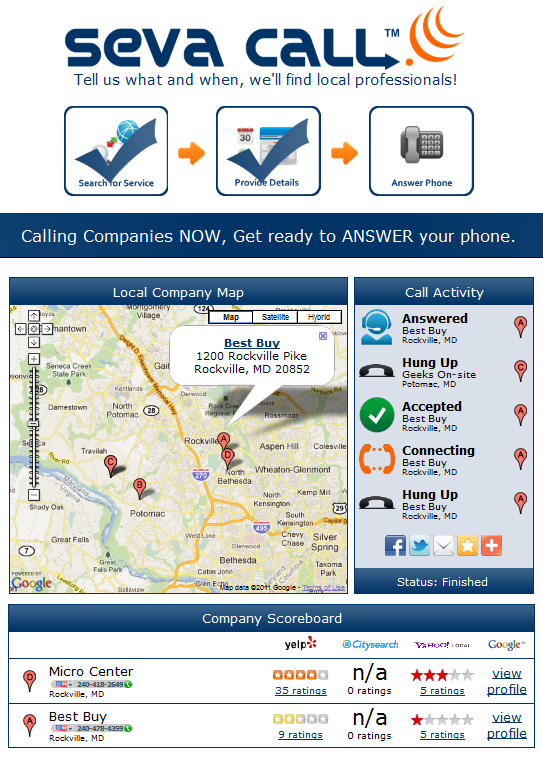 Startup Seva Search announced Tuesday that it has raised $1.3 million in Series A funding for its first product, Seva Call. The Metro D.C.-based local search company is soon to launch a search engine that lets consumers connect via phone with local businesses, in near real-time. Investors in the Series A round early stage venture fund Fortify.vc; Ed Mathias, Tim Sykes, Jay Virdy, David Eisner, Andrew Bachman, Jigar Shah, Krishna Subramanian, Vishal Gurbaxani, Arjun Dev Arora, Saket Saurabh. Also investing are angels Paul Silber, David Krauskopf, John Lapides, Roger Richter, Glen Hellman and John Cammack. Additional support came from Badder Alghanim, James and David Dingman, Alex Edmans and John Villa. The principle upon which Seva Call is based is reminiscent of the sentiment behind AT&T's commercial "Reach out and Touch someone." This very successful series of ads, which ran in the 80's, promoted the power of the voice to reach and connect with someone. Seva Search's approach to business is one that gives back power to the voice, and brings back its personal touch. "Look at the service as not only a location-based-app answer to the good old phone directory, but as an algorithm, which we built from scratch, that will connect consumers to the best vendor in their area," said President and co-founder of Seva Search, Manpreet Singh, in an interview with me. Let's say a consumer is stuck on the side of the road with a flat tire, or car problems. He enters a request on the mobile app (or website) and then waits for a call back. The app request is then routed to several vendors who have signed up with Seva Call, giving priority request to vendors whose feedback score ranks higher. The vendor then calls back the car owner directly. First business to call-back usually gets the work, and Seva Search gets pay based on the results of these exchanges. Singh said," We have established that prior to choosing a vendor, the consumer wants to speak with him or her. Then based on the conversation, makes a final decision. We are combining old technology, the phone, to new technology, our proprietary algorithm, to facilitate the process. Within 90 seconds, the consumer gets a call back. And vendors has access to a new market." In the process of receiving these requests, the business also builds its customer database, whether it obtained the work or not. "The $1.3 million will be used for marketing and distribution of the product. We basically want to change the way consumers search for vendors, and how vendors look for new customers," said Singh.